The new craft office is coming along swimmingly! 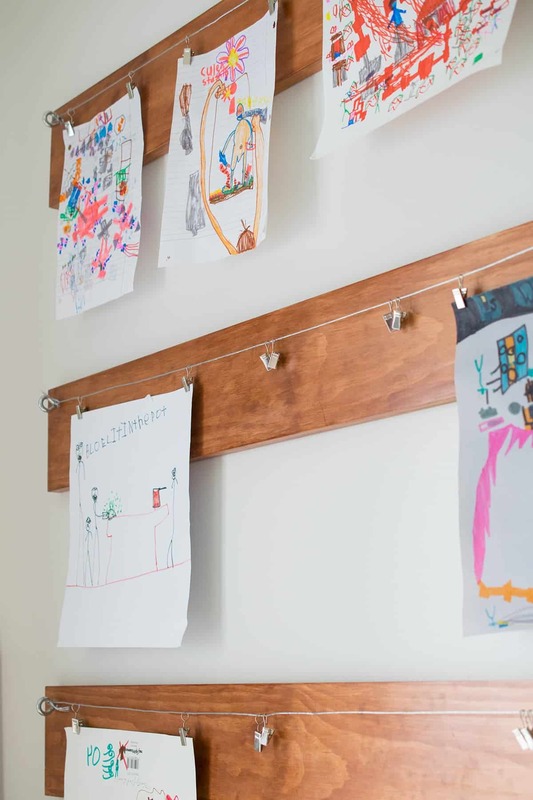 It still needs a few more finishing touches like, well, doors, but I am happy to show my child’s very own art display board and how to make your own. Hint: It’s so easy! Now, my son is quite the artist, as in I could probably wallpaper an entire room just with his favorite artworks. We consistently go through them and sort some into save vs trash but there are still so many left over. Of course, I want him to feel pride in his art (while saving our poor fridge from looking like a mummy). So an art gallery wall was the perfect solution. I started by staining the 3 boards. I used 4-foot poplar boards with no knots and Cabot Autumn Glow Stain. I sanded them with 320 grit sandpaper and very slightly rounded the sharp edges. I used a brush on the first coat but the boards were so dry, they literally soaked in the stain in seconds and it made it difficult to fix any runs or blemishes. I sanded a bit more to get rid of any brush strokes. After that, I used a soaked, waded-up t-shirt and this worked much better. The T-shirt applied thinner coats but I didn’t have any brush strokes. 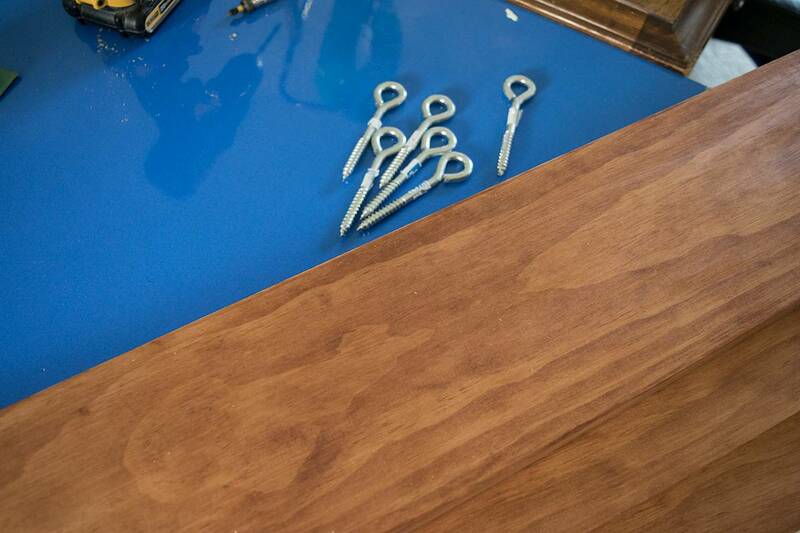 After that, each board got 3 thin coats of satin polyurethane. 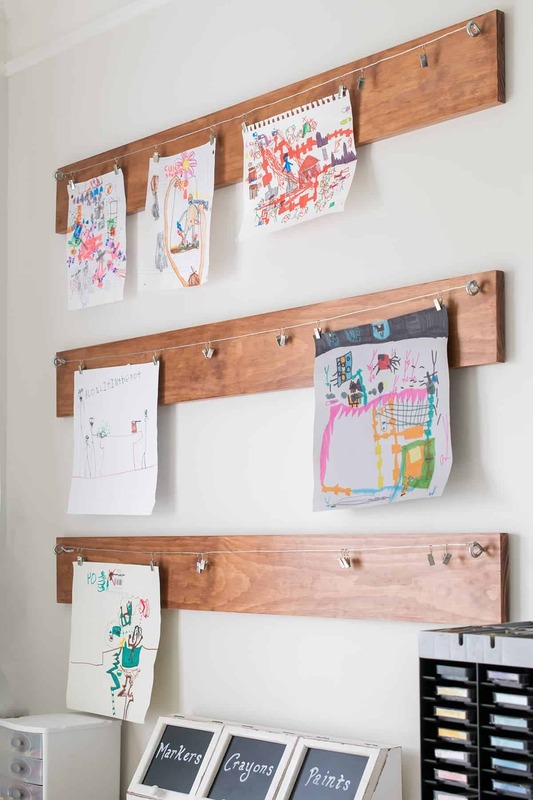 The boards are hung directly on the wall using the eyelet screws. Of course, we pre-drilled a hole in the board and the wall to anchor the screws. We also used a level to make sure the boards were straight. After hanging the art display boards, I used wire to string the clips between the eyelet screws. I simply twisted the ends very tight. I found these cute clips at Micheal’s in the craft supply storage section. 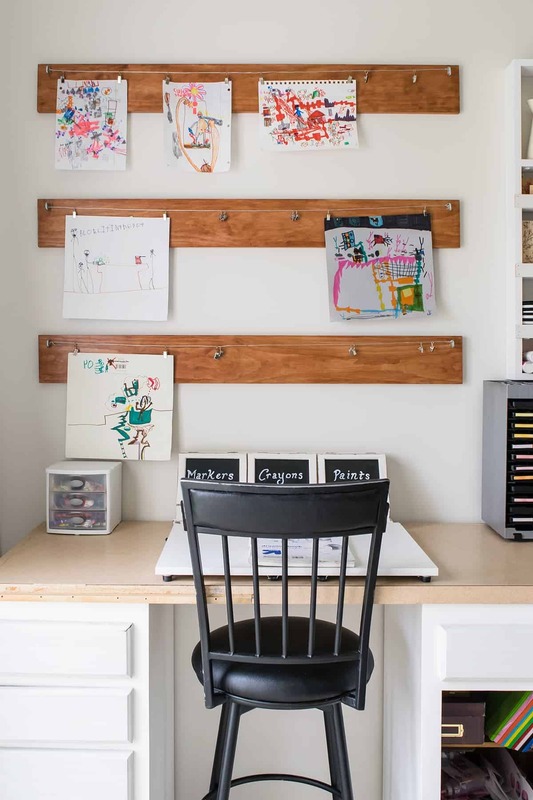 Because my child’s artwork can vary wildly in size, I mostly use two (or more if really large) clips to hang each piece of art. I love how it finished out his desk area. Now he has his own personal art work area. I thought about putting something like this in his room but it definitely feels like it belongs here. I am totally in love with your space! I am like you use to be, stuff everywhere. I love that you included a spot for your son. I am going to keep my daughters in mind when I finally get my spot. They are always into my stuff but I bet it would make them feel pretty special if they had their own spot. Thanks for the idea! It kinda feels like another art angel got her wing when someone get an amazing art space! Lol. Congrats! Your comment made my day! Probably my entire week, actually. I hope you can find your own spot to enjoy soon! Where did you get the colors, markers & paint storage at???? I bought that at Kohl’s department store in their home decor section with the picture frames and such. This is exactly what I **need**. My kids love to draw anything in a paper. Now, I know what to do with their drawings (because they want to keep it). Thank you for sharing. It’s lovely! I love this! It’s great how it’s so easy to swap out the artwork, and it still looks very classy and doesn’t look juvenile or like it should be in a preschool room. Great job!